Why are Purvana Hair, Skin and Nail Vitamins so good? This formula helps the body produce more collagen and elastin. Collagen is the most abundant protein in the integumentary system, while elastin allows your skin to stretch like a spring and then return to its original shape. These specialized proteins owe their unique properties to the sulfurbonds holding these tissues together. Since sulfur is vital to their structure, we include the highest quality of organic sulfur, Methylsulfonylmethane (M.S.M.). We also synergistically combine silicon to help support the structural integrity and healthy development of these vital tissues. 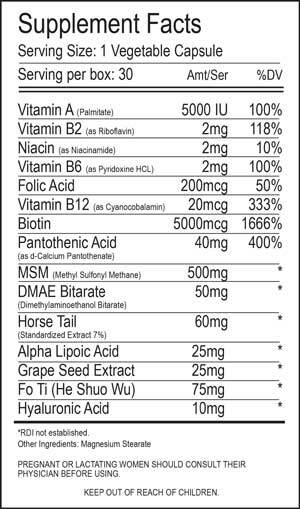 Purvana™ Hair, Skin and Nail Vitamins also includes Vitamin A from Palmitate, all of the B Vitamins, and most importantly, extremely high levels of Biotin as this is the vital ingredient for the growth of healthy hair, skin and nails. To start your quest for stronger, thicker fuller hair, healthier skin and stronger nails, Biotin is definitely an essential supplement. Biotin is quite an important part of the vitamin complex of B vitamins which is seldom used as a supplement, together with Vitamin B2, B6, and B12. For Biotin to properly be absorbed, essential minerals are also important to this process. Why Should you take Biotin as a Supplement? The process of canned or cured foods often destroys the necessary Biotin that we need. If you are experiencing very dry skin or dark skin spots, thin and nails that are breaking easily or hair that is dry and damaged you will benefit tremendously from taking PurvanaMAX Hair, Skin & Nails supplement that is supplied in a vegetable capsule. This formula combines Biotin, along with other essential nutrients such as Vitamin A, Niacin, B2, B6, B12, Folic Acid and Pantothenic Acid. These help in the absorption of biotin into your blood stream. With this you will start to notice stronger, nails that are less brittle, healthier longer hair that grows at a faster rate and skin that is more vibrant. Biotin, which is water soluble, needs to be constantly replenished everyday in your diet since what is not used is expelled from your body. Our product is an excellent source of these needed nutrients since it provides your body what it needs to produce faster growing, stronger, and all around healthier hair. Wellgenix produces Purvana™ Hair, Skin and Nail Vitamins while adhering to the strictest quality control measures and standards currently available for the manufacturing of nutritional supplements. Suggest Use: For best results take one softgel daily. Contains Soy. Pregnant or lactating women should consult their physician before using. LOVE this product. It not only works for me, but I have recommended it to at least 6 people who now take it and LOVE it.